KILLER ROBOTS. The very mention of those soulless death machines conjures nightmares of Skynet becoming self-aware, Cylons on the warpath, or renegade Roy Batty. From Terminator to Battlestar Galactica, murderous automatons have woven their way into the public psyche, as has our fear that robots will take over the world and convert us all to batteries Matrix-style. Star Wars admittedly lacks any single iconic killer robot (sorry, Darth Vader—you’re only part machine). Nevertheless, from battle droids to IG-88 or probe droids, the galaxy far far away is filled to the brim with autonomous weapon systems. Despite their futuristic depiction in movies, automated weapon systems are nothing new in real world militaries. The U.S. military does not employ any fully autonomous weapon systems, but they’ve been using weapons with varying levels of autonomy for decades. For example, the Army’s Patriot missile system and the Navy’s close in weapon system (CIWS or “Sea-Whiz”), two semi-autonomous “man on the loop” weapon systems, have been in service for years. Not exactly the T-1000, but remote Gatling guns and giant automated missiles will do. The legality of autonomous weapon systems has become an increasingly important and controversial topic as technology has rapidly advanced. In 2015, Tesla founder Elon Musk and renowned scientist Stephen Hawking organized a coalition of 1,000 robotics experts who called for a ban on automated smart weapons. As the U.S. military’s arsenal continues to evolve, the lawfulness of increasingly automated weapons will remain a major issue on the international stage. While the Galactic Empire has its fair share of automated weapons, we’ll keep our focus on the prequel era and the Separatist army’s droid legions. Before we tackle the legality of all those battle and destroyer droids, let’s take a step back and get some framework on the issue. Watch your back, HAL 9000. The dreaded B-1 battle droid will haunt your dreams with its ruthless efficiency. First, let’s figure out what the term “autonomous weapon system” means. There is no agreed upon international definition for the term, but the U.S. Department of Defense (DoD) defines automated weapon systems as those that, when activated, are capable of selecting and engaging targets without further human intervention. In other words, although a human operator might have the ability to take control of the system, the system is capable of operating without any human involvement. The Separatist Army’s legions of battle droids and other mechanical terrors clearly qualify as autonomous weapon systems. Take the mainstay of their forces, the trusty B-1 battle droid. While battle droids became slightly more advanced as the Clone Wars dragged on, they were always built to be capable of operating without further human (or Neimoidian if we’re going to be all technical about it) intervention. Even in The Phantom Menace, when a single Trade Federation ship controlled the entire droid army, the droids themselves operated without any involvement from federation personnel. While the battle droids may have acted based on programming and Trade Federation orders, they were never directly controlled. Droids can be seen doing all sorts of independent tasks from guarding prisoners in the Theed Palace hangar to mounting a full assault on the Gungan army. The more advanced models, like the Commando Droids or Super Tactical Droids seen in The Clone Wars animated series, performed even more complicated tasks with total independence. Even though Separatist commanders retained the ability to shut down or override the droids, they still qualify as autonomous weapon systems. Viceroy Gunray showcases the latest in autonomous laziness systems with his frivolous robot chair. While the international community can’t agree on a definition for autonomous weapon systems, there is universal agreement that the law of armed conflict (LOAC) applies to them. To figure out whether a particular weapon is legal, we have to turn to the creatively named area of LOAC known as weapons law. Weapons law focuses on the overall legality of the weapon, without regard to how it’s used. As an example, a poison like the Blue Shadow Virus in The Clone Wars, is deemed per se unlawful under LOAC, no matter what the intended use. 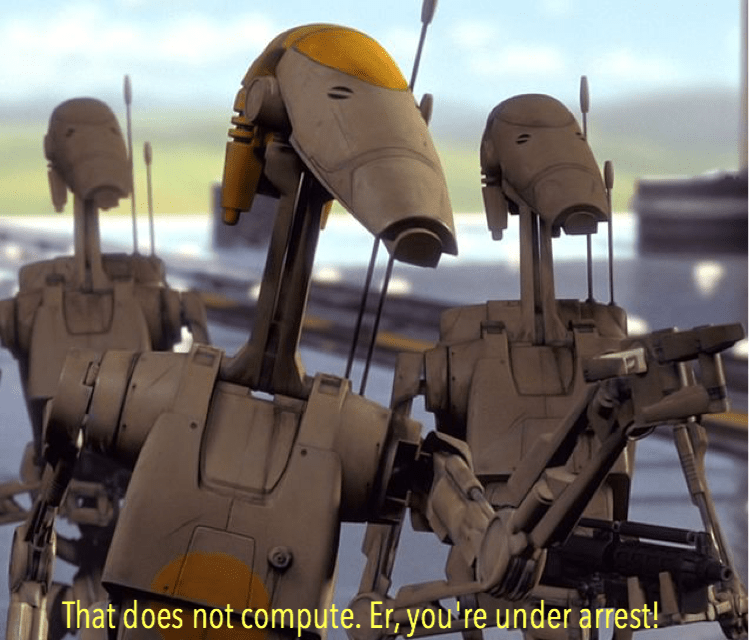 Even if the Separatists wanted to use the virus against a lawful target, such as a group of clone troopers on patrol, it would still be illegal to use. Whether autonomous or not, the legality of all weapons are determined by the same three distinct rules: (1) The weapon cannot cause unnecessary suffering or superfluous injury by nature; (2) The weapon cannot cause uncontrollable effects; (3) The weapon must not be indiscriminate by nature. As humanity became increasingly good at creating horrible weapons, the outcry for rules that would reign in the suffering grew. The ban on weapons that cause unnecessary suffering was one of the earliest prohibitions codified in international law, first appearing in the 1899 Hague Convention. The rule, which is now woven into international law, is intended to ban weapons that, by their nature, aggravate a combatant’s wounds. A prime real world example is projectiles filled with glass, which cause major additional wounding. The glass fragments are then very difficult to remove because they cannot be seen on x-ray, which only compounds the suffering. The very finest in terrible, horrible, no good Imperial weaponry. 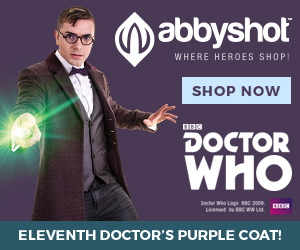 Grand Moff Tarkin would be so proud. 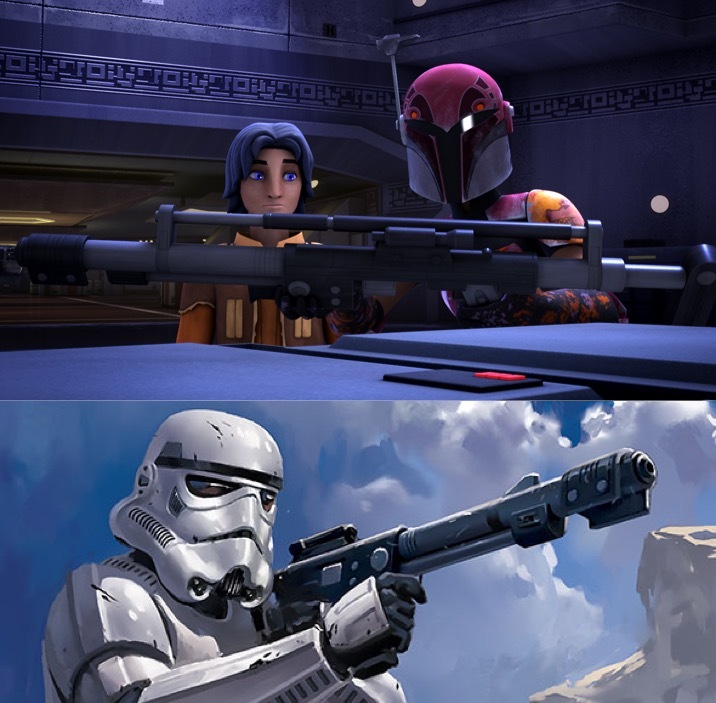 In Star Wars Rebels, the Empire’s dreaded T-7 ion disruptor rifles are a gruesome example of the sort of weapon that would be banned by this rule. T-7s were long rifles that would disintegrate organic beings atom by atom, leading to an excruciating death. While Boba Fett might fully approve of those effects, the T-7 disruptor is exactly the sort of weapon that would be banned in the real world. Coincidentally, the Galactic senate ultimately banned disruptors due to their terrible effects. In contrast, the bulk of the Separatist Army would not violate this rule. Battle droids function like normal soldiers, armed with blasters and standard programming to engage and destroy the enemy. Even though those droids could theoretically be programmed or ordered to cause unnecessary suffering, they aren’t designed cause those effects. That distinction is critical because the rule focuses on the weapon system’s effect on a targeted individual, not the manner in which it is used. Any weapon system can be used in an illegal manner, but that doesn’t mean that the weapon itself is automatically illegal. Second, weapons law prohibits the use of weapons that have uncontrollable effects, regardless of how accurately they can strike targets. Unfortunately for the Separatists, their prized Blue Shadow Virus gets the axe under this rule. While the virus might only be used against a lawful target like clone troopers, there’s no way to control its spread. Those same clones could easily infect civilians and other innocents, triggering an uncontrollable spread of the virus. However, Separatist automated droid forces don’t cause the same spiraling uncontrollable effects. Although swarms of droids were wielded to inflict devastating damage, their blasters, rocket launchers, and other conventional weaponry cause predictable damage with controllable effects. The droids’ automation doesn’t change that conclusion. The Threepio-Battle Droid hybrid: An uncontrollable powder keg of murderous robot rage. Finally, LOAC prohibits weapons that are indiscriminate by their very nature. Under Additional Protocol I of the Geneva Conventions, any means of combat that cannot be directed against a specific military objective is unlawful. In other words, if the weapon cannot be aimed at a lawful military target, it’s probably not legal. Though not autonomous, the Death Star, everyone’s favorite orbital war crime, is a perfect example of an illegal weapon that is indiscriminate in nature. The battle station was designed to destroy entire planets, which is probably the most black and white example of indiscriminate targeting ever (just ask the poor Alderaanians). Separatist droid forces don’t run afoul of this rule. 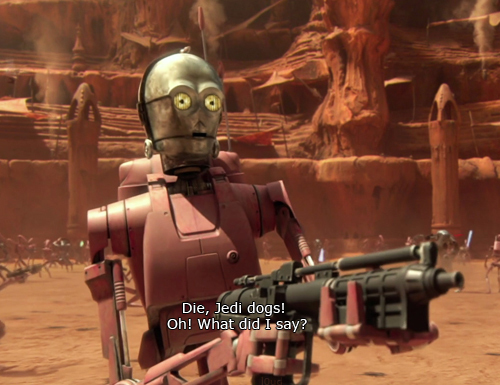 Battle droids were often made to kill indiscriminately throughout the Clone Wars, as we saw with their killing of Naboo civilians in The Phantom Menace. But just because they can be used in that manner doesn’t mean they are indiscriminate by their very nature. The droid forces aren’t pre-programmed to kill anyone they come into contact with. Similarly, they have the ability to aim their weapons (even if they happen to make Stormtroopers look like crack shots) and select their targets. Given their programming, the lack of individual control over the droids doesn’t render them indiscriminate weapon systems. Just as with any conventional weapon, the legality of new autonomous weaponry must go through a legal review process. Under Article 36 of Additional Protocol I, High Contracting Parties such as the U.S. are required to determine whether the Geneva Conventions or international law would prohibit the new piece of weaponry. In practice, the U.S. conducts a complex and thorough weapons review process. The process starts early in the weapon’s development process and continues through production to ensure the weapon is legal. As we’ve seen, the fact that a weapon system is automated doesn’t control the analysis, but instead is merely one factor. 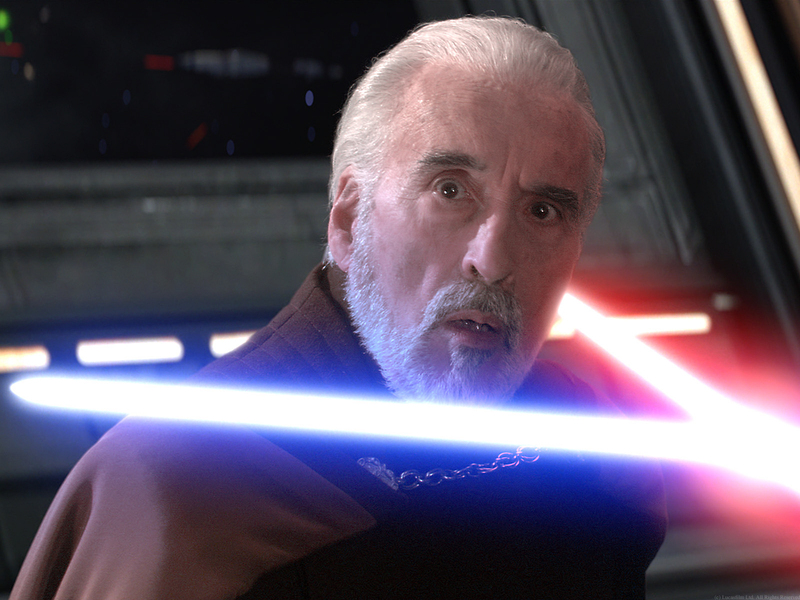 Count Dooku’s reaction after being told the Separatists must conduct legal reviews on all of their droid weapons. I’m going to go out a limb and declare that the Separatists don’t have any mechanism for reviewing the legality of their weaponry. Their frequent loose adherence to the law of war strongly suggests that they’re not all too concerned with the opinions of galactic lawyers. 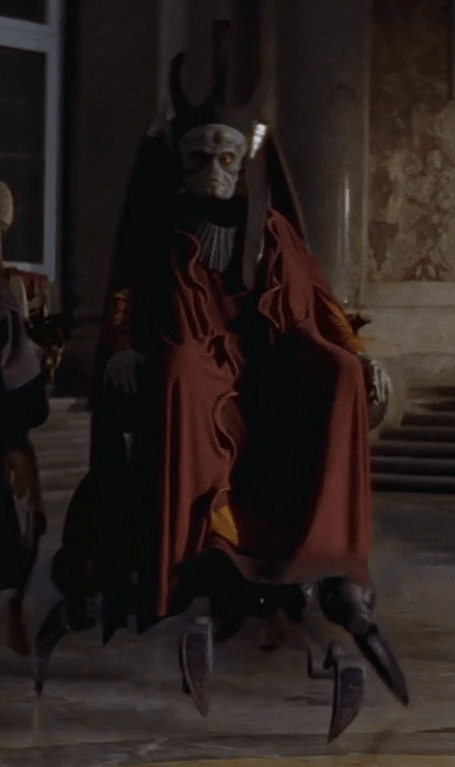 Nevertheless, Viceroy Gunray can rest easy on his robot chair—while the Separatist droid hordes may be fully automated, they don’t run afoul of the law of armed conflict. Previous articleCould a Vulcan Adopt a Human Child?